It may seem like a hopeless situation. Caught between the rock of our increasingly technological lives and the hard place of total tracking, surveillance and control, it's easy to simply throw in the towel and resign ourselves to the boot stamping on the human face forever. But as bleak as things seem in the short term, I'm equally convinced that in the long term we are going to see a world of uncontrollable, un-censorable, irrepressible technological innovation, a world where decentralized, peer-to-peer communities of interest are the norm and the idea of centralized surveillance control grids are a thing of the past. Believe it or not, there are already people working on the forerunners to this world of decentralized, peer-to-peer freedom solutions. The technocrats would obviously prefer you not know about them. So today let's examine a few of these technologies and what they're helping to achieve. If you're an American of the constitutionalist ilk, you may think that the ability to keep and bear arms is a sacred right enshrined in the Second Amendment. Those who fear human liberty, on the other hand, will argue that you're trapped in an antiquated, 18th century mindset. And you know what? They're right. In the 21st century, the real legal battlefield in the war over gun rights will not be the Second Amendment, but the First Amendment. You see, in the coming years our very concept of what actually constitutes an object will change radically. What matters now is not physical objects, but physibles. Yes, you read that right: physibles. A physible is the digital blueprint for creating a physical object through technology like a 3D printer. It's not the finished product, but the recipe for that product. And just like a recipe for the perfect chocolate cake is more dangerous for your waistline than the cake itself (because it allows you to make thousands more of them), so to could the "recipe" for a physical object like a gun be more "dangerous" to would-be gun controllers than the gun itself, because with those instructions and the right piece of technology, anyone, anywhere can manufacture as many guns as they like. Case in point: Defense Distributed, Inc. 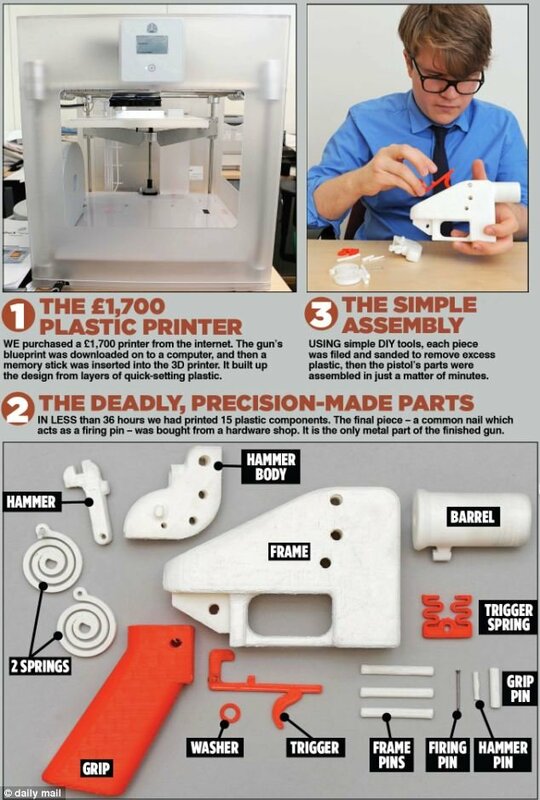 Founded in 2012 by Ben Denio and Cody Wilson in order to "defend the human and civil right to keep and bear arms as guaranteed by the United States Constitution," Defense Distributed released the plans for a physible, 3D-printed single shot handgun called "The Liberator" on the internet in 2013. To the surprise of absolutely no one, the State Department's Office of Defense Trade Controls stepped in just two days later and sent a letter demanding that the plans be taken down. Their justification? The State Department's interest in protecting national security--specifically, from preventing foreign nationals from learning how to produce weapons and weapons parts--actually outweighs American citizens' right to free speech. That's right, the possibility that someone in a nation hostile to the US might learn how to 3D print a one-time use pistol is apparently why the State Department is allowed to revoke the First Amendment and stop people from publishing information on the internet. So this is how gun control has officially become a First Amendment issue. As a result, Defense Distributed were forced to take down the plans. But Cody Wilson and the company he helped create have not given up their fight against the injunction. They have filed a lawsuit against the State Department challenging the take-down and plan to fight it all the way up to the Supreme Court if need be. "The fact that national security might be permanently harmed while Plaintiffs-Appellants' constitutional rights might be temporarily harmed strongly supports our conclusion that the district court did not abuse its discretion in weighing the balance in favor of national defense and national security." So the good news is that the era of physible guns is already here, and it has made the Second Amendment debate effectively moot. The bad news is that the era of physible guns is here and it has made gun control into a First Amendment debate. And once again, the courts are not likely to be on the side of freedom. But guess what? In those two days that the plans were up on Defense Distributed's website they were downloaded 100,000 times. The plans are already out there and no court decision can undo that. And it's only a matter of time until someone else comes along to make their own, better 3D printed gun, and no court decision is going to prevent that from happening. The average internet user has no idea how the internet operates. They are generally happy to pay Internet Service Providers like Comcast to collect their personal information, assign it to their IP address and hand it over to the government whenever requested. Even those who are concerned and seek out a free speech-protecting, privacy-advocating ISP (should one exist) generally don't encrypt all of their traffic and/or run it through VPNs, meaning that Uncle Sam already has access to their data anyway (via the back doors the major telecoms have happily provided them). The problem, as always, is the centralization of what was created to be a decentralized network. Rather than a decentralized, peer-to-peer, mesh network of computers around the world sharing data directly, the internet relies on a series of ISP nodes that give most of the users their "on-ramp" to the information superhighway. And those nodes, as students of the kakistocracy are all too aware, are easily controlled, disrupted, surveilled and co-opted. As always, however, the problem may be easy to identify but the solution is difficult to construct. Although a server-based internet goes against the logic on which the internet itself was built, transitioning from a server-based internet to a decentralized peer-to-peer internet is an engineering problem of massive proportions. So along comes MaidSafe with the SAFE network, aka "Secure Access for Everyone." SAFE describes itself as a "crowd sourced internet." Rather than using data centers and servers common within today’s internet, which are prone to data theft and surveillance, the SAFE Network uses advanced P2P technology, that joins together the spare computing capacity of all SAFE users, creating a global network. You can think of SAFE as a crowd sourced internet. It is on this network that everyone’s data and applications reside. Essentially, SAFE is a P2P program that encrypts data and then chops the encrypted data into pieces, distributing copies of those pieces throughout the network for storage and access. Users decide if, when and how that data is shared and accessed, or whether it is shared at all. The SAFE network will also contain programs and applications, meaning that users will be able to use the network for decentralized messaging, emailing, data storage, video conferencing, apps and whatever else people use the controlled and surveilled ISP-centralized internet for. To access the network, users will create an account username (no personal details required) and allocate a section of their hard drive to the network. They are then rewarded in cryptocurrency for their part in helping to operate the network. If this sounds like a massive project, it is. MaidSafe had been working on the technology for a full decade before they released their alpha version of the SAFE network (targeted at "very early adopters" and with limited functionality) to the general public last year. As usual with projects like this, the alpha version is very much a work in progress and this is not yet a project for the casual user. But those who are inclined to dabble in it may be interested in any of the numerous guides to getting started that have been created by the technology's advocates. Long-time Corbett Reporteers will remember my 2015 video "The Revolution Will Not Be YouTubed" where I discussed Google and YouTube's de-monetization of AntiWar.com and WeAreChange and a slew of others in the independent media. Apparently justified by arbitrarily-decided "infractions" of vaguely-defined Terms of Service (like AntiWar's willingness to publish some of the pictures from Abu Ghraib documenting what the US military was actually doing in Iraq), YouTube and Google have steadily been depriving independent journalists of the ad revenue that so many of them were relying on to do their work. The story picked up again last year when this crackdown impacted some larger channels, and continues until today. Just this week YouTube took down the Legal Insurrection YouTube channel, described as an "influential conservative politics and law website." Their crime? Posting a video of a proceeding of the Modern Languages Association. As part of a larger report on the MLA's resolution to boycott Israeli universities (the resolution was rejected), the video clearly falls under "fair use" provisions in the copyright law. Still, the lords of GooTube decided (outside of a court of law) that the video was a copyright infringement and, without warning or complaint, all eight years of videos on the Legal Insurrection channel were removed. This is the fundamental problem with all of the major social media platforms today. When you sign up for an account at one of the big sites (Facebook, Twitter, YouTube, Instagram; they are all essentially the same) you are requesting an account on their platform. And that access is only granted if you agree to abide by their vaguely-defined Terms of Service, invariably written in densely-packed small type legalese and read by exactly no one. So when they decide that a certain type of content is too controversial, too uncomfortable or too dangerous to the alphabet soupers and their pals in Silicon Valley, they can revoke your access to the servers as they see fit. A number of "YouTube alternatives" have sprung up over the past decade promising a free speech haven (Veracity Videos, anyone? ), but invariably they have followed the YouTube format: host everything on centralized servers and farm out all the videos from there. However sincere the creators of these websites are in their quest to provide a censorship-free video sharing platform, they are immediately hit by the problem of scalability. If they get any attention at all their bandwidth costs start soaring. Soon they're holding fundraisers and slapping advertising over everything in order to make ends meet, and users abandon the platform when the servers can't handle the traffic. There's a reason why YouTube has such a stranglehold over the video sharing market: It's extremely expensive to maintain. Only a giant like Google could afford to run such a site. Enter BitChute.com. It's a simple idea that at once conquers the problem of centralized servers and scalability. Relying on WebTorrent technology, the site works on the same principle as bittorrent or other torrent clients, meaning it is peer-to-peer and decentralized, with users automatically sharing the videos they are watching with other users on the network. It requires no data centers to operate and in fact inverts the scalability problem; the more active users there are, the better the site will function. But unlike torrent applications that require installation and set up, WebTorrent allows BitChute to function right in the browser with no set up or installation necessary. "Here we believe people should be able to express their opinions and choose their topics. If existing services cannot allow that, then let's make some that will. The question is, how to disrupt a platform as well established as YouTube? It cannot be on their terms; we think we might have an answer, decentralization by torrents and tailored matchups for monetization. *More on the monetization to come soon. "Rather than needing massive data centers with humongous bandwidth costs, torrents depend on many people sharing videos from their home computers. While this has been possible for many years through bit torrent, bit torrent applications have steep learning curves; this site aims to make the torrent experience seamless by working entirely in the web browser." Just three weeks into the project, the site is still very much in its infancy and most of the functionality is yet to be realized. For the moment all of the torrents are being seeded by the site developer (@RayVahey), but soon others will be able to host torrents from their own site. That's when the real fruits of the project and the potential for a truly decentralized YouTube alternative will be realized. In the meantime the proof of concept is up and running smoothly. Check it out for yourself. Now don't get me wrong: I am positively not endorsing or putting a seal of assurance on any of these particular technologies. As always, people will get hung up on the particularities of a given project and lose sight of the idea itself. Defense Distributed might lose its case against the State Department. MaidSafe might never get past its alpha release. People might lose interest in BitChute or it might never catch on in the first place. But to point at the failure of this or that instance of the idea and dismiss the ideas themselves is to miss the point. These technologies already exist. The information is out there. The ideas are in the ether, and they're bulletproof. Decentralization is the way of the future. This or that government might try to suppress these technologies by force. This or that court might rule basic freedoms illegal. This or that legislature might pass laws against thoughtcrime. This or that police force might place guards on every street corner to stop people from sharing the light of liberty. But the ideas already exist, and in the end there's no putting the lid on this genie bottle. The revolution is already here. The only question is: Do you want to be a part of it? What an A W E S O M E article James, bravo! I'm SO glad to see it here, so apropos. I'm saddened that after 6 hours only 2 have commented on it. I am resteeming it so it will get more visibility. Perhaps you're testing the waters with this to see if it's worth more of your time to pursue Steemit as another source of your material. Perhaps my comment on your last post made an impact. Whatever to reason, I'm really glad to see this excellent example of your work, and that you are still interested in technological trends, though I still believe your primary interest is political not technological. And that is perfectly OK with me. BTW, like hearing you on LRN.FM via the Declare Your Independence show, tho I often miss it being the first hour. Hancock is someone who may be weighted more towards the tech and less the political, kindof a mirror image of how I see your interests. What an excellent balance the 2 of you make! @corbettreport, your post has been chosen by @STEEMNEWS.ONLINE as one of today's promoted posts for its excellent content. We've upvoted, resteemed and published it through Facebook & Twitter. As the author of a SNO featured article, you've been awarded one TRAIL coin. Please stop by the SteemTrail Discord server to learn more about how to claim your TRAIL coin. You will need an Open Ledger account to do so. STEEMNEWS.ONLINE is the @SteemTrail for #news and watches the #steemnews tag most closely. Please consider supporting excellent news articles by making steemnews.online one of your operators on Streemian, in addition to steemtrail. 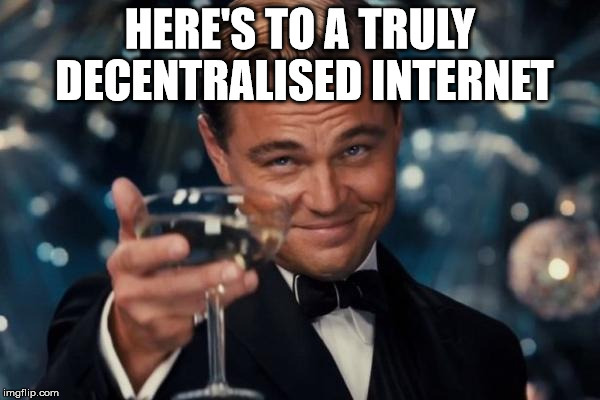 Thank you for your hard work and contribution of excellent content to Steemit. I just registered on BitChute! Steemit should collaborate with them. We should have support for BitChute videos integrated into platform. On Youtube, Dailymotion and Imqq one can get paid for uploading content. Does the same hold for Bitchute? Comments like this are what makes viewing the comments part worth its time. I did not upvote it because I know that once 7 days had passed, upvoting does no good and in fact does bad by wasting voting power. Thanks james, for the info and links here and in your previous video https://www.corbettreport.com/the-social-media-exodus-has-begun-heres-where-everybodys-going/. Downloaded and beginning to learn about the various platforms. Attempted to promote, but learned that I cannot donate what I don't possess (empty wallet syndrome)... wrong end of learning curve. You have both introduced and educated me on the importance of these new technologies/tools and i'm grateful for it. I call this "Cooperative Agorism". It's not your typical Konkinist "Agorism", but a vastly more diverse way of fighting the good fight to create a better society. Now they make quantum computers i think when they will use them some things will change somehow. how did you got access to uploading feature on bitchute? Do you know authors of that?